A new wig, Jenna, from the ever awesome TRUTH HAIR had me feeling like a bad bad girl. 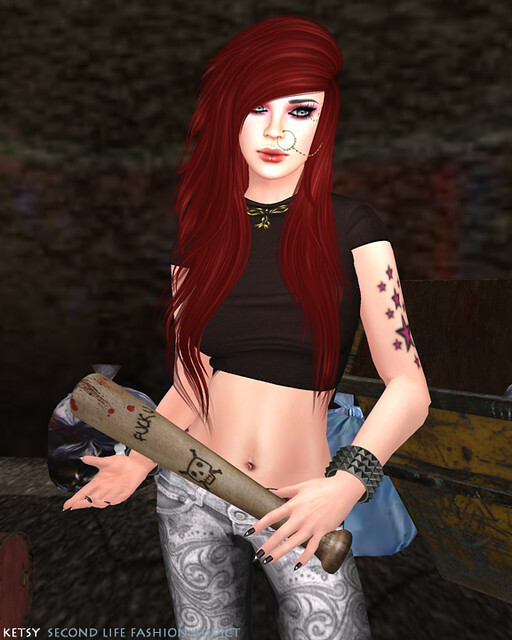 I set out to get my revenge on the grid, wearing items I tracked down at the Dark Style Fair, which is still in full swing until June 7th. Make sure you check it out, particularly if other June events are crowded to the rafters, there is so much dark and lovely to be had! Exposeur's Mean Machine pose set, also exclusive to the Dark Style Fair set the scene to perfection! Speaking of the scene, I headed out to my favorite grungy back alley, at the Cashmere Keane mainstore, to find that the closing sale is still in effect, so make sure you add it to your must shop list too!